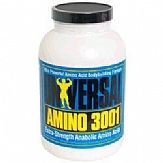 Amino 3001 by Universal Nutrition utilizes whey protein hydrolysates for superior absorption. If you want to get bigger faster, this supplement is exactly what you are looking for. With more power packed amino formula – 3001 mg of peptide-bonded whey hydrolysates per tablet, this product is great for bodybuilders who engage themselves in both cardio and weight training. Amino 3001 consists of branded chain amino acids, BCAAs or BCAA pills. The formula is rich in glutamine, methionine, alanine, and arginine. Universal Nutrition enhances its supplement with vitamin B6, L-carnitine, and chromium picolinate which makes it a superb balance when size really does matter. Each capsule or tablet contains just 12 calories, 50 mg of Vitamin B6, and 3 grams of protein. Other ingredients include pancreatic digests of whey protein, medicago sativa, L-carnitine, magnesium stearate, and stearic acid. A fine way to build muscle mass and exceed your nutritional needs and desires. It is recommended by Universal Nutrition that the best way to take Amino 3001 is to consume 2-4 tablets on an empty stomach three times daily before meals and after training as directed. Rich in amino acids, this supplement does its job to bring you the best results from your intense training regimen.